This private motorcycle collection has grown in size overtime from its original home within a 20′ x 20′ workshop, where it shared space with various specialised tools and maintainance lifts. The collection of owner restored machines now resides in a purpose built barn, creating a wonderful blend of rustic charm and two wheeled heaven. 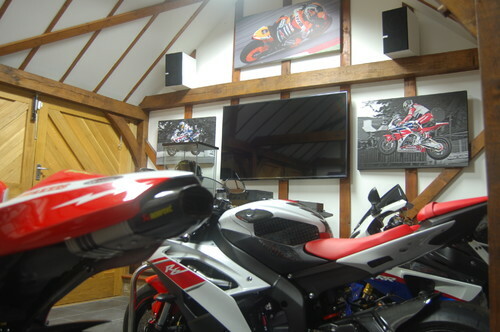 Having integrated technology within the main house, a humble audio system and smart TV was added to the motorcycle barn to provide added entertainment for the proud owner of this ever growing collection of modern classic motorcycles.